TA DOMATIA AYTA EINAI KOITONES.. MOIRAZETE ME ALLOYS..
. In dorm rooms you may not be together in the same room..
Our central studios are all with double beds or single beds. 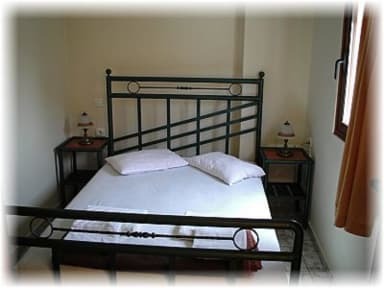 All rooms are equipped with full kitchen facilities , TV,air-conditioning,balcony. We are only 50 meters from our beautiful sand beach and there are a lot of great restaurants at the beach front. It's a great beach area with a great feeling in the summer evenings. We have also opened an internet coffeehouse. Chania is a beautiful and picturesque city with reminders of the past at every corner. Chania is the main town in the west of Crete, and from here you can visit some of the most beautiful natural sights and beaches in Greece. You can hike through the Samaria Gorge in one day. Hike to the first monastery of Crete -1000 years old in Agia Triada area.Visit the white and pink sand beaches unique to Crete. Stavros Lagoon,Balos Lagoon, Elafonisi Island, Falasarna Bay! Le propriétaire très sympathique parle français il nous a donné une chambre à 500 m de l’auberge. C’était un dortoir maisnous étions que deux. Nous avons pu constater la propreté des lieux chambre comme salle demain. Nous étions à à peu près 1 km de la ville. Nous avons pu garer facilement la voiture c’est-à-dire devant l’auberge. Lieu très calme je recommande. Very nice place 20 minutes walk from the old town center. The manager is fluent in French and English which is very helpful. I booked for 1 night, ended up staying for 6. Constantino makes you feel welcomed and gives you good advice. Clean and comfortable room, nice balcony with clothe-dryer. I was by myself half of the time, as it was early in the season, but with 4 beds in the room I don’t think it gets very crowded. Be aware that there are no lockers and that you have to turn on switches for the fridge and the hot water. 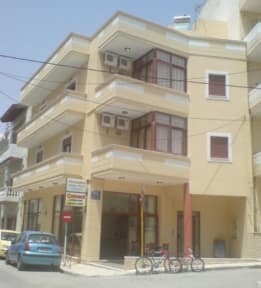 20 minutes walk to the old port and the bus station but close to beaches! Good excursions too! J’ai beaucoup apprécié l’aide donné par l’hôte! Le principal point négatif est l’humidité dans la chambre qu’on m’avait assigné.